After I’d been to an Indian restaurant a couple of times, I tried to recreate the meals I had tasted there. Of course I failed. Back then I had only a couple of cookbooks in my possession and nothing more. It didn’t occur to me to look for recipes on the internet. (It’s been a long time! Did didn’t even have my own computer back then.) I thought the “curry” recipes I had in front of me might suffice. Well, they didn’t and I ended up with hopelessly underseasoned vegetable stews. Only slowly I learned about the power of spices. I didn’t want to be afraid of them and the next time I tried to make an Indian dish, I bravely doubled every single spice that was mentioned in the recipe. That was a start. One day I found out that curry powder comes in many different variations, when I visited a small tea and spice shop in my university town. They had about 15 different curry blends and every single one was so much more aromatic and interesting than the generic blend I used to buy at the grocery store. Today I have a ridiculously huge spice rack. And I learned a couple of tricks to make spices really shine in my food. I don’t remember who taught me about toasting spices. Whoever it was, I want to thank you. I couldn’t believe my nose when I smelled a bunch of toasted cumin seeds for the first time. And I finally understood one of the secrets to Indian food and really aromatic vegetable dishes. I toast spices often now and I do not reserve this technique for Indian dishes. 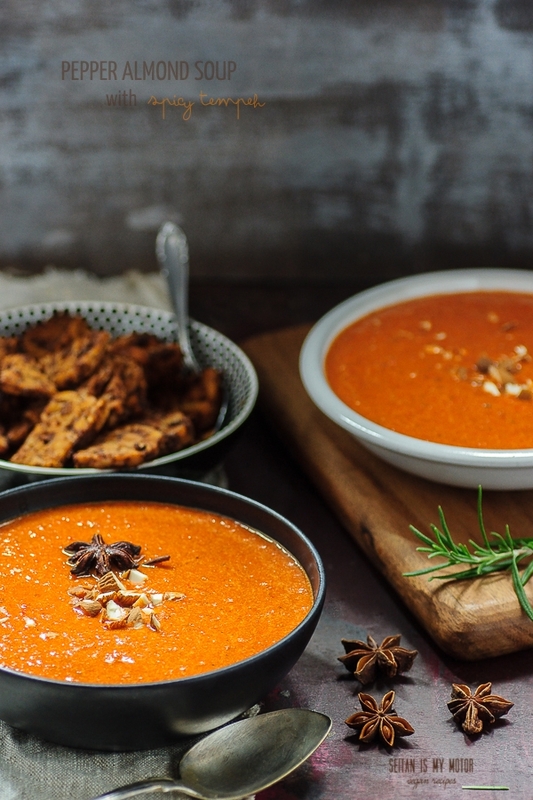 Toasted spices make even this simple soup taste spectacular and it doesn’t take much time to get the best out of them. Because a vegetable soup isn’t really that filling, at least not for me, I also made a batch of marinated tempeh to go with it, using the same spice blend. It is so flavourful that you don’t even have to marinate the tempeh. Just mix everything andplace it in the oven, bake it and serve with your soup. To make the spice blend, heat a cast iron pan and add spices. Toast until fragrant, for about 1 - 2 minutes. Set aside to cool. Once the spices have cooled completely, grind them into a powder using a coffee grinder. To make the tempeh, preheat the oven to 200°C. Cut the tempeh into thin slices and cut each slice into half both length and width wise, so that you get 4 small rectangles per slices. Place all ingredients for the marinade in a casserole dish and stir in the tempeh. Bake for 34-40 minutes, or until all the liquid has evaporated. Make sure to stir the tempeh from time to time. To make the soup, decrease oven temperature to 180°C (350°F). Place the almonds on a baking sheet and toast them for about 5-8 minutes, or until slightly browned. Remove from oven and set aside. Add oil, leeks, onion, garlic, and peppers to a large pot. Fry for 10 minutes. Add remaining ingredients (except for vinegar and salt) and cook for 15 minutes. Place almonds and about 1/2 cup broth from the soup in a blender and blend until creamy. Add the rest of the soup and blend until smooth. Season with vinegar and salt and serve with tempeh. 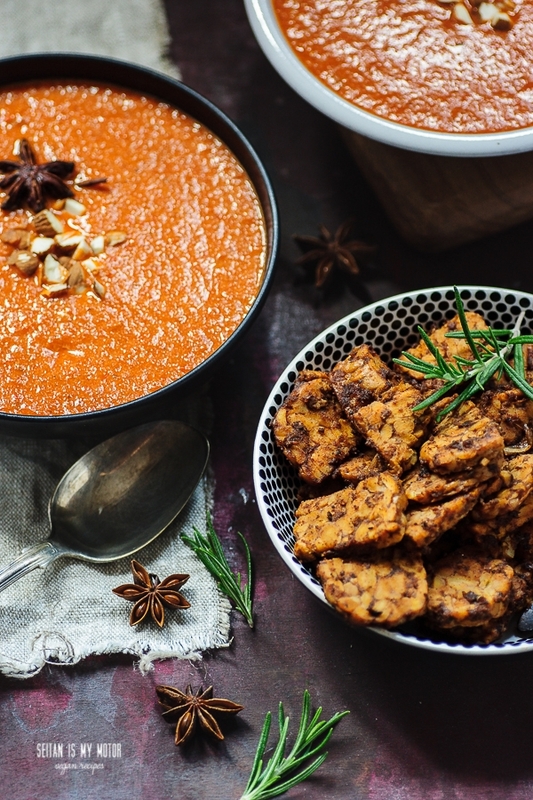 This looks lovely – soup is so lovely in hot weather as well as cold because it is light when you don’t feel like a huge filling meal – and the tempeh looks really delicious. I don’t often toast spices but I did so tonight in an old recipe and wasn’t quite sure I got it right so it is nice to see your encouragement to toast spices more. My mum uses mostly salt and pepper, which goes a long way. But homemade spice blends sound amazing!